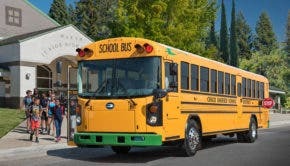 The plug-in electric school bus startup Blue Bird has begun taking orders for its new electric Type C & D configuration school buses, according to a new press release. The company is reportedly the only one in the US currently offering such configurations. Mercedes says series production of its new Citaro E-CELL electric bus will begin by the end of 2018. Both its electric city bus and electric school bus will be available by 2019. Daimler, which owns Thomas Built Buses, says it will begin offering an electric school bus with 100 miles of range to North American customers beginning in 2019. 13 electric school buses from Motiv Power are now in use in the Sacremento area. They join 4 more already in service in the San Joaquin Valley and 2 more beginning trials in Los Angeles.